The crazy family of aging rocker Ozzy Osbourne are all present and decidedly incorrect in a brand new video slot branded THE OSBOURNES released at All Good Microgaming Casinos this week....and a full house of added opportunities to win is for the first time expanded by an COOL NEW ON-SCREEN TRAIL FEATURE that unfolds above the reels! 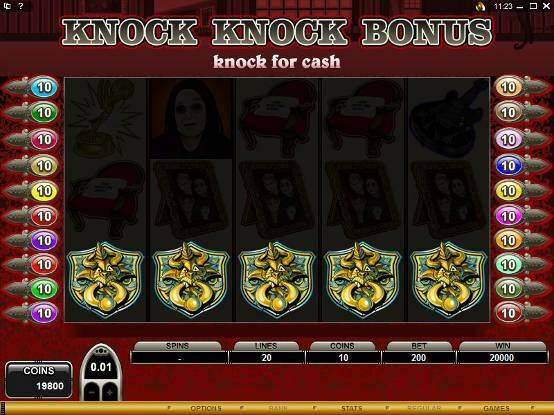 The Osbournes 5 reel 20 pay-line video slot's theme is licensed from the somewhat dysfunctional and definitely wild rocker's family, made famous by the television and media comedy series. The outstanding artwork that carries the theme captures the outrageous spirit and humour of the internationally appreciated clan to support a truly engrossing new slot that is jam-packed with great opportunities to score free spins, multiplier boosts and solid cash prizes. In the main game, players can win up to 75,000 coins, and in Free Spins 150,000 coins, whilst in the new Door Knocker bonus a further 50,000 coins is available and additional bonuses can bring in another 3,000. There are THREE very different BONUS GAMES in this very neat new slot: Mini's Trail Bonus (with free spins + trail feature), the Knock Knock Bonus and the Grab a Gift. The betting range is anything from 0.01 to 0.50 and up to ten coins a line, making a maximum bet of 100.00 possible. 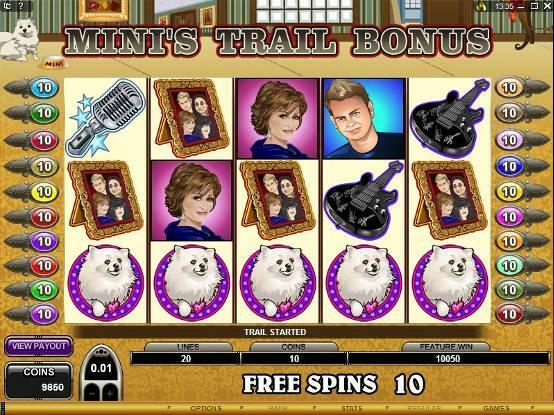 The Osbourne's snowy white pet Mini is both the trigger and the indicator in the first ever use of an on-screen trail bonus within the free spins. Get 3, 4 or 5 Mini symbols across the reels and 10 Free Spins are triggered, together with a trail feature above the reels. Mini will trot across the screen as free spins are achieved, moving across 4 levels - one each for Ozzy, Sharon, Jack and Kelly - with the goal of reaching Ozzy for the full reward, although each level carries a cash incentive if completed.